This story was updated at 9:15 a.m. ET. North Korea is preparing to launch a controversial rocket with a liftoff made more complicated by the country's location on Earth. The nation has said it plans to loft an Earth-observing satellite aboard its Unha-3 long-range rocket sometime between Thursday and Monday (April 12-16), and has already started fueling the booster. While North Korea insists the satellite onboard, called Kwangmyongsong-3 (Bright Shining Star-3), is intended for peaceful purposes, foreign leaders have accused the launch of being a cover-up for a military missile test. And the launch site's high latitude, 39.4 degrees north of the equator, is only adding to the controversy. The North Korean launch site is in the village of Tongchang-ri in the country's northwest, about 35 miles (50 kilometers) from the city of Dandong on the Chinese border. A latitude so far from the equator — about 2,700 miles (4,300 km) away, compared with about 1,950 miles (3,100 km) away in the case of Cape Canaveral, Fla. — makes reaching popular orbital corridors difficult. "They can only directly launch into inclinations higher than their latitude, which for this new facility is 39.4 degrees," said Brian Weeden, a former orbital analyst with the U.S. Air Force who is now a technical adviser at the Secure World Foundation. "So to get to a low-inclination orbit such as GEO, they would need to do a pretty big maneuver after it’s in orbit to change the inclination." 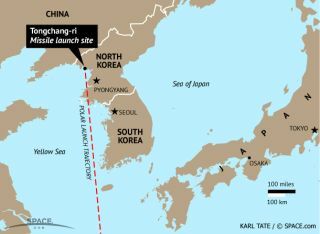 North Korea's position near other populous countries, including South Korea, China, Japan, and the Philippines, adds to the concerns about the launch, because rockets aren't flown over populated areas for safety reasons. If an accident and a crash landing were to occur, the danger to people would be minimal over open ocean. That's why NASA, for example, launched its space shuttles eastward off the east coast of Florida. "The main reason the North Koreans are using this new launch facility is that it allows them to launch south and avoid overflying other countries early in the flight," Weeden wrote in an email to SPACE.com. "That was a problem with their previous launch site on the [northeast] coast: Launches from it overflew Japan, which caused a lot of problems. However, even this new launch facility has its limits." This practice is somewhat unregulated, with the onus placed on nations to act as good neighbors when launching spacecraft. "These types of restrictions are not new to North Korea; every country faces them if they want to conduct safe and responsible launches," Weeden said. Because of North Korea's latitude and position near other nations, some launch experts doubt Pyongyang's claim that it is aiming the satellite toward a sun-synchronous orbit, which would allow it to pass over any given point on Earth at the same time each day. Such an orbit would be very difficult to reach from North Korea without passing over numerous populated regions, amateur satellite watcher Ted Molczan pointed out on the SeeSat listserv. 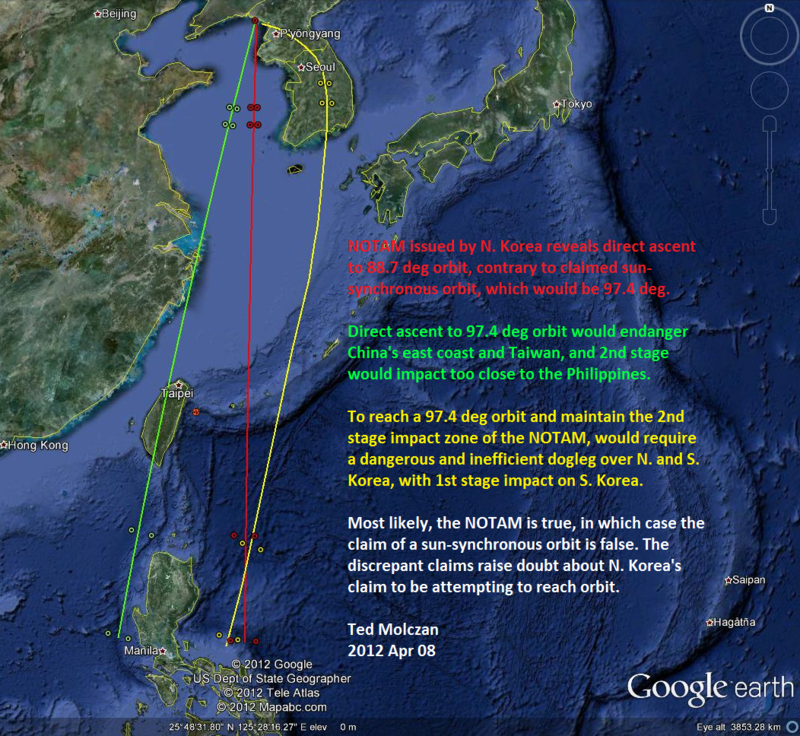 The discrepancies caused Molczan to question whether North Korea was attempting to place its satellite in orbit at all. "Ted and I differ slightly on this," Weeden said. "I agree that there is a mismatch between what they are claiming and what they are actually capable of doing, but I think they are still trying for a space launch and trying to put a satellite in orbit. To me the mismatch indicates they care more about being able to launch a rocket in a manner that is 'responsible' and being seen as doing what everyone else does, and less about having a fully functioning satellite that can do everything they say it can." And even if the launch is a missile test instead of a scientific satellite launch, many of the same concerns apply. "The same overflight issues are present in missile launches — it's bad form to launch a missile in the direction of one of your neighbors, and in areas where there are heightened tensions it could cause problems," Weeden said. "Countries tend to follow the same restrictions on the azimuths when launching missiles and have established 'ranges' where they conduct the tests, along with notices to aircraft and ships of danger zones if they are flying outside of national borders." SPACE.com staff writer Denise Chow contributed to this report. You can follow SPACE.com assistant managing editor Clara Moskowitz on Twitter @ClaraMoskowitz. Follow SPACE.com for the latest in space science and exploration news on Twitter @Spacedotcom and on Facebook.